This list showcases the potential choices for some of the film’s headlining roles like Vito, Michael and Sonny Corleone, as well as Tom Hagen. 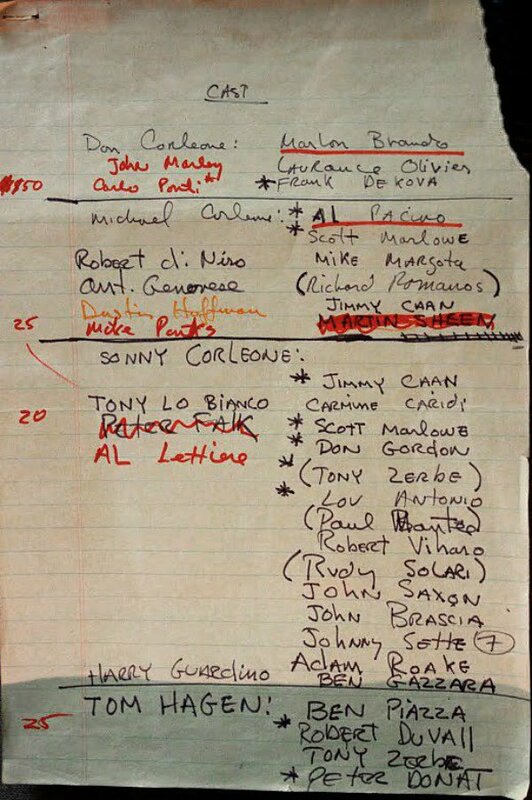 Coppola admittedly has some pretty shoddy handwriting, but its clear to see that the actors chosen for the roles are present among numerous others – some famous, others not so much. One of the most noteworthy alternatives for the role of Vito Corleone (which eventually went to Marlon Brando) is the option of Lawrence Olivier. Brando’s depiction of the titular mobster has become legendary in its own right, but we can’t help but feels as though Olivier would have brought a certain Shakespearean sensibility to the silver screen icon. The list also features some potential choices for the part of Michael that would have been truly fascinating. Particularly noteworthy are Robert DeNiro, Marin Sheen, and Dustin Hoffman. While DeNiro would eventually go on to play a young Vito Corleone in The Godfather Part 2, Pacino seems like the better choice for the franchise’s main character primarily due to his more sensitive take on the character. We love DeNiro, but he characteristically brings more darkness and intensity to his characters- something that made him better suited for the part of Vito. On the other hand, Hoffman reads as though he would have had almost too much innocence to sell the darkness that overtakes the young Michael Corleone by the end of the film. This is made all the more intriguing by the fact that Al Pacino originally didn't want to take part in the film in the first place. This list provides some interesting hypotheticals for us to ponder, but at the end of the day we feel confident saying we think Coppola made the rights calls for all of his actors. The Godfather is a timeless classic, and it owes that reputation very much to the stellar turns from its deep roster of thespians. If you haven’t checked out the picture of the list, do yourself a favor and give it a look, but be thankful that The Godfather exists as the iconic film that we know and love.